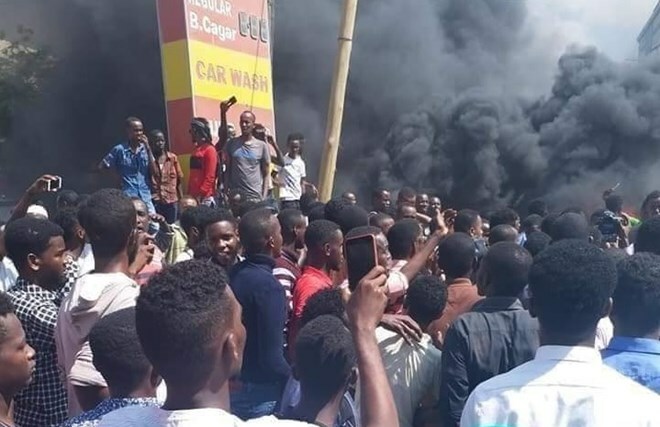 Ads By Google “They (security forces) killed two people and after the demonstration, we understand police killed three more people,” lawmaker Mahad Salad told Reuters. Hundreds of demonstrators descended on Mogadishu streets on Saturday to protest the shooting death of an auto rickshaw (bajaj) driver and his passenger by a policeman. The United States said Wednesday it has resumed airstrikes against the al-Shabab Islamist group in Somalia, after a brief pause that followed accusations from Amnesty International that it had tried to hide civilian casualties. The latest airstrike was carried out on Tuesday near Jilib, in the Moyen-Juba region southwest of Mogadishu, and killed one fighter, the U.S. Africa Command (AFRICOM) said. The group was forced out of the capital Mogadishu in 2011 and then progressively from the major cities by African Union troops. At least two people were killed and more than seven injured, late Thursday, when a car bomb exploded near the gate of the national police academy in Somalia’s capital, said officials. The blast occurred near General Kahiye Police Academy in Mogadishu, police officer Mohamed Bulle told reporters in the Somali capital. “A car bomb blast targeted a security checkpoint near General Kahiye Police Academy. We can confirm that two civilians, including a woman, were killed and seven others were wounded,” Bulle said. The wounded were rushed to hospitals for treatment, he added. The academy is a highly protected compound located in Mogadishu’s Hamar-Jajab neighborhood. The Al-Shabaab group claimed responsibility for the attack. The attack comes hours after the Somali government announced long-awaited military operations against al-Shabaab in the Lower Shabelle region about 40 miles (64 kilometers) west of the capital.